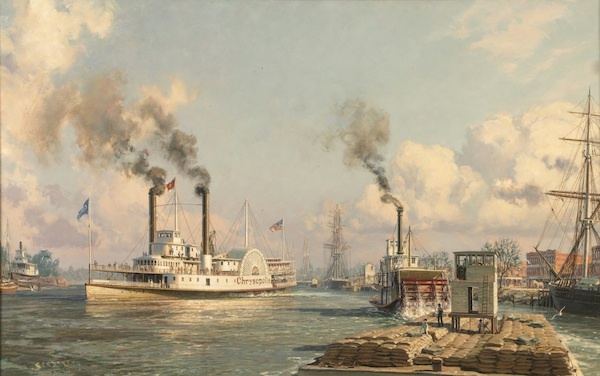 The American Society of Marine Artists was founded in 1978 by a small group of the country's leading maritime artists. They were looking for mutual support and companionship, to enhance public awareness of the genre, to explore and record the history of American marine art, and to encourage the work of newcomers. The membership has always been nationwide, and the current membership of over 500 is distributed across 40 states. National exhibitions are held at roughly three-year intervals (the 2012-13 show is our 15th) and they take place in public museums. ASMA also holds periodic Regional exhibitions. and as such can not engage in the sale of member's work. Our mission is to recognize, encourage and promote marine art and maritime history; to encourage cooperation and free interchange among artists, art teachers, art students, craftsmen, publishers, collectors and others with interests related to marine art and the history of marine art; to provide a registry for artists, to hold exhibitions, and to promote the study and improvement of marine art. ASMA is dedicated to fulfilling an informational and educational role. Sacramento: The Celebrated River "Steamer Chrysopolis Leaving for San Francisco in 1870"